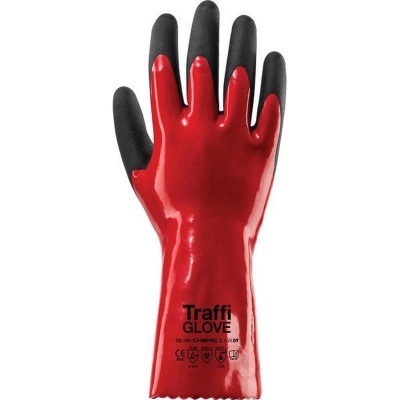 The TraffiGlove TG1080 Chemic Cut Level 1 Chemical Resistant Gloves are unique gloves as they offer excellent dexterity and breathability, while protecting against a wide range of chemicals. Furthermore, they are designed for use in wet conditions with a anti-skid grip pattern that is ideal for secure carrying. Comfortable and flexible, these gloves can be used for extended periods without developing hand fatigue. The TraffiGlove Chemic Gloves are available in five sizes that should suit the hands of most users. Please measure the circumference of your hand around the knuckles (excluding the thumb) with your hand open and your fingers together, and the length of your hand from the tip of your middle finger to your wrist. 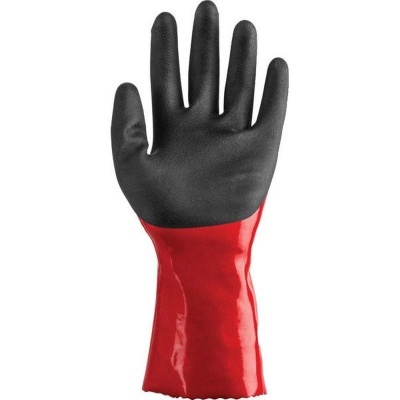 These gloves provide an excellent grip while not being sticky or anything. They're very easy to get into and to pull off again due to the woven pattern on the inside. Also they resist all the chemicals I get to use, not even any stains are left on the exterior.